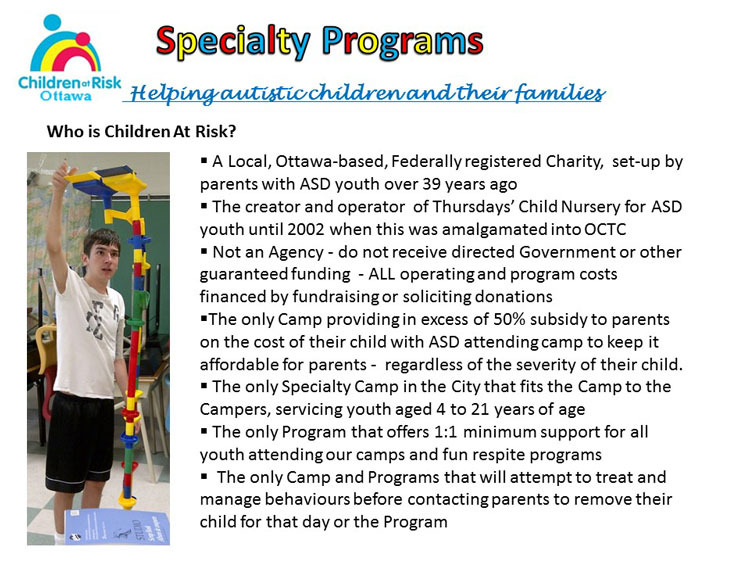 Provide services and programs to families of children diagnosed within the Autism Spectrum Disorders to develop their child's behavioural, communications and social skills, and to advocate for their ongoing needs. 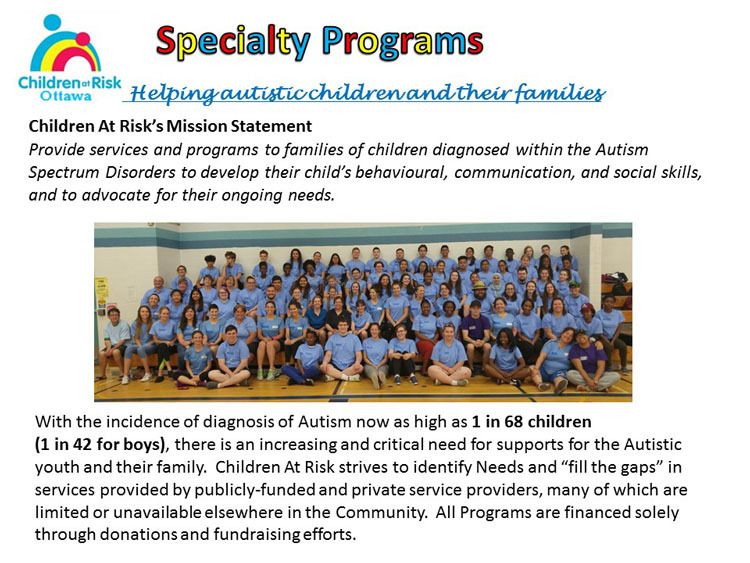 Our Community–Based Special Projects are financed through donations and fundraising. Nominal fees are charged to cover registration and operating costs. Ahh, the holidays ... A time to get together with friends and colleagues, share stories and a few drinks ...and rush around the malls in a frantic search for that perfect gift. Ahh, the joys of the holidays!? I hope you are enjoying more of the get together and a little less of the shopping. We also hope that some of you have been able to participate in our Saturday Fun Club or Family Fun Night to provide a little free time as you gear up for the holidays. Children at Risk achieved yet another new milestone in 2018, providing support and activities to more children and their families at our Camp than in previous years with 356 Weekly Camp Spots and an increase in Fun Club numbers too! We are delighted that we can help you and your families with these Supports. The Staff and Board Members at Children at Risk continue to develop more sustainable funding initiatives and support partners that will allow us to continue to provide the many programs that are so necessary for the children and their families. The need to find more sustainable funding is based on the reduction or elimination of some previous fundraising initiatives and sponsors and the increase in the cost of our programs due to higher wages in 2018. 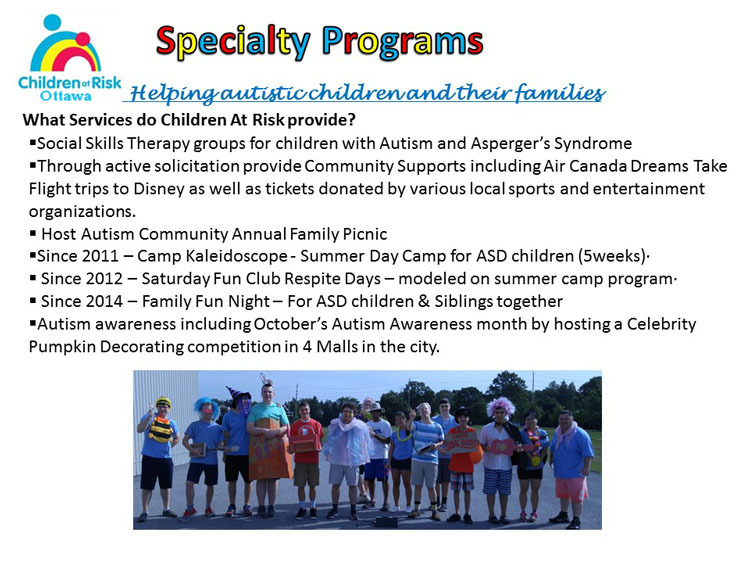 Our signature program is Camp Kaleidoscope, which runs for 5 weeks each summer. The demand has increased every year since we began the Camp in 2011 with 4 weeks and only 89 spots (400%). The feedback we get from both parents and the children is extremely positive. 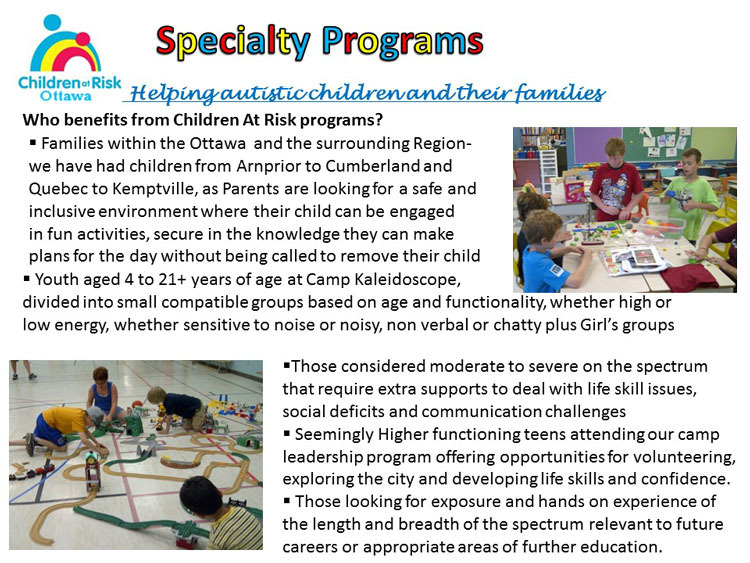 Our Saturday Fun Club Respite Sessions reached new records of children attending this program. We ran 6 sessions in the Fall, with great participation. We are quite pleased to know that the Fun Club can be so important for both our children and parents. We plan to offer up to 10 sessions over the Winter and Spring. NEW – we will be having ON-LINE Registration! It is best to book your sessions early, so you don’t miss out. 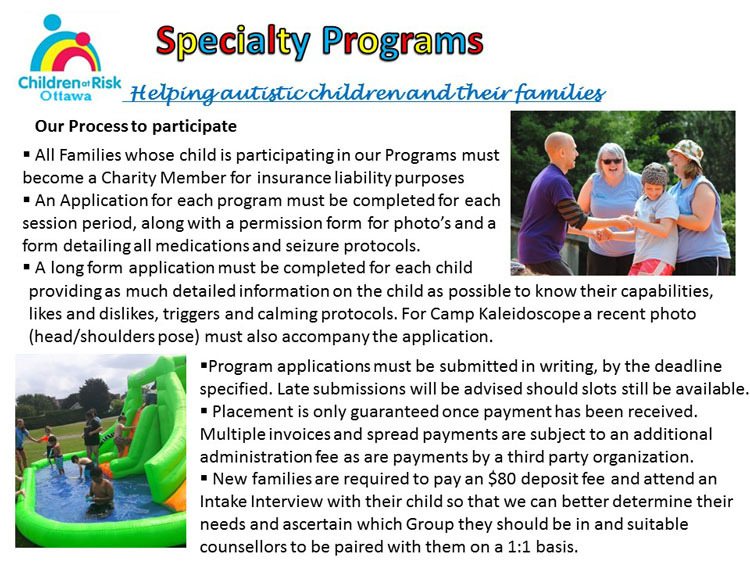 We also have a Family Fun Night planned for May and other various times throughout the year, which includes siblings. It is also well attended. We continued with our regular fundraisers this Fall, including the Celebrity Pumpkin Contest. We used a new format of only electronic bids this year. We had some good success, but found some dearly missed their Paper Bidding – so may tweak the Contest for maximum benefit next year. 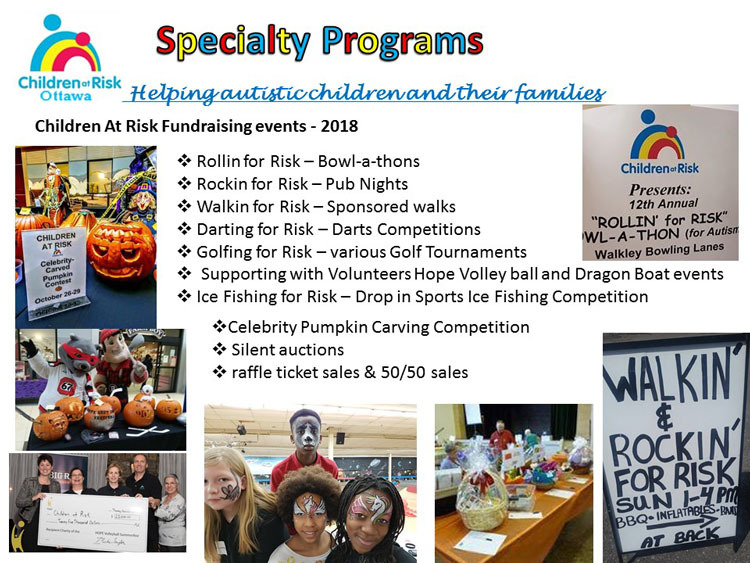 We will also be running our “Rollin' for Risk” Bowl-A-Thon fundraiser on Sunday, January27th at Walkley Bowling Lanes. We are hoping for all 30 lanes to be filled this year! I would like to say a special thanks to our Executive Director Brenda Reisch, Administrator Bambina Lemme and Special Projects Coordinator Hazel Smith, who have kept the charity running smoothly throughout the year. I also want to acknowledge the efforts from our volunteer board members Walter Davidson, Graham Estey, Rob Gentles, Carrie Groulx, Alexandra Jeffrey, Linda Kwasnick, Marca McManus, Bill Pocock and Melissa Van Alstine. Thanks to all of you. Finally, I want to wish all the children, parents and volunteers a safe and happy holiday season!